Catching up on three remastered CDs and a couple of vinyl boots. 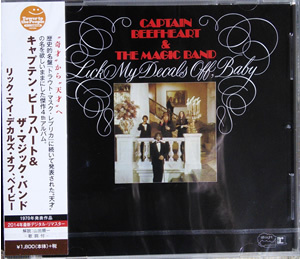 The Japanese seem to follow their own odd agenda of releasing Beefheart albums. However, when they do it’s usually worth checking out, especially when they remaster anything. And that’s what we have here. At the back of 2014 (yes, I know, but I’ve only just got hold of a copy) they released a remastered version of ‘Lick My Decals Off, Baby‘. It’s packaged in a jewel case with booklet containing lyrics in English and Japanese. It has been remastered by Ryuichi Tanaka (Mixer’s Lab) at Warner Music Mastering. This is much better than the feeble remastering done on the recent ‘Sun Zoom Spark‘ version of ‘Decals’, the sound has much more presence and the bass has real punch. I think this will be by version of choice for the time being. Thanks to Joshua for telling about this one. These two albums will be released on May 27, 2015 as mini-LP reissues. There appear to be three formats – basic SHM CD, platinum SHM CD and SHM-SACD. The sound will no doubt be excellent but they’re not cheap – £25 to £40 depending on the format! Bit of an oddity this one. A 7″ vinyl with picture sleeve of two songs ‘Steal Softly Thru Snow’ and ‘Click Clack’ taken from the band’s appearance on the German TV show “Beat Club” in 1972. Apparently only 50 copies were cut so it’s definitely a rarity. Not sure why this was issued as the tracks are readily available on the Lost Broadcasts DVD and double vinyl LP. Pity more thought wasn’t taken with the picture on the front which shows the 1975 touring band rather than the 1972 band that was on “Beat Club”. The only Beefheart product issued as part of Record Store Day 2015. Unfortunately it’s another of Ozit’s shoddy products. 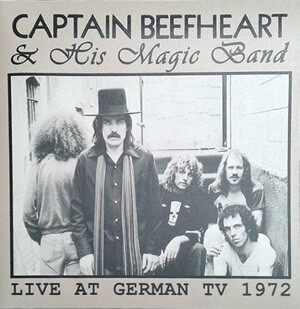 As with other recent releases of theirs this has been attributed to Don Van Vliet & The Magic Band, presumably in fear of being chased by Gail Zappa now she’s trademarked the name ‘Captain Beefheart’. Released on limited 180g yellow vinyl. Although that doesn’t improve the sound quality of this poor sounding 1972 audience tape – as least Ozit are telling the truth when they say it’s “rough and raw”. 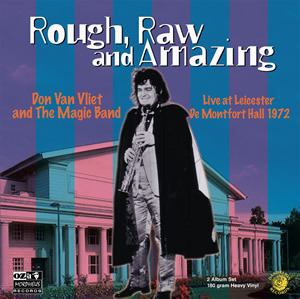 Recorded at the De Montfort Hall in Leicester on 27 April 1972. You don’t need to buy it as it’s available elsewhere for free in probably slightly better sound quality. Got this Japanese ‘Decals’ from CDBANQ.com for $25.24 including shipping to uk. Sound is terrific. I bought Decals on vinyl when it was originally released. 44 years later I finally have a worthy issue on CD of what I’ve always considered the greatest album ever made! Christ! At last! Just wanted to add: I bought the iTunes version of Decals a few months ago. While it is an improvement over the vinyl version (of course), it’s inferior to the 2014 remastered edition. So, if you’re going to add Decals to your collection, get the 2014 CD version. Thanks Steve, Joshua and Philip. So is the consensus here that this version of Decals is noticeably better than any previous releases, whether CD or vinyl? I’ve already got one vinyl and two CD copies, so would only want yet another version if there was significant improvement over the previous ones. Hi Ian, yes, I think this is the best version I’ve heard. It’s better than the other three vinyl and three CD copies I have! This 2014 remaster is over compressed and full of digital clipping. Yeah, it’s loud and has more bass than other versions – but so what? I’ve only checked Track 1 with Adobe Audition, 18.000 clipped samples in 2.29 minutes, -8 LUFS. Not sure what went wrong there, everybody‘s stereo has a volume control, right? There’s still hope for a good remastering job of DVV’s catalog for the digital age. Yes, the one from the Tower To The People series. It’s far from being a reference master, much more an in-your-face take on the original. After all the good reviews I was counting on this version but I find it completely underwhelming with it’s lack of detail and dynamics. It’s a typical 2000s remastering job, albeit on the more careful side if you compare it with the seriously bad remasters made during the last 20 years. More ‘go’ with everything instead of a careful restoration of the original recording. The digital clipping makes it unacceptable for me. OK I’ve gone with that – just got an ‘order shipped’ email. Similar verdict from TwentySmallCigars on the Beefheart Corner over on Zappateers.com (Page 5 of the Sun Zoom Spark thread). Special thanks to Philip for his pointer to the site. Very reasonably priced (the item itself and shipping costs), given how expensive some of the more esoteric Beefheart items can be. Suddenly Japanese releases become more reachable! In case anybody was wondering, the Japanese reissues of “Doc At The Radar Station” and “Ice Cream For Crow” are complete garbage. They are made from hissy UK copy tapes and not the original masters, which are in the US. You can even hear some kind of primitive noise reduction malfunctioning/pumping in and out. It’s awful! Don’t waste your money on these, or any UK release of these albums. Hey, John, thanks for letting us know these are not as good as they should be. Do you have a recommendation for the best version these two albums? Today I’ve received the Caroline Blue CD version of DRS which I had ordered following your recommendation. Found it in the mailbox while heading out of the house for a couple of hours drive. The version impressed me on my car stereo, it sounded powerful, balanced and true. Back home I made an in-depth comparison with the Japanese 2015 SACD, a remaster I’ve always enjoyed, actually the only digital version I’ve heard so far. While the SACD is a different sounding master certainly isn’t ’garbage‘. In 1980 Virgin was still a British label, why would the original UK master tapes be a mediocre/hissy copy? The Caroline Blue CD has less top end, true, but all the hiss is also there, it’s just more filtered. If something, in 1980 CD mastering engineers where keen on taking advantage of their brand new toys. The ‘primitive noise reduction malfunctioning/pumping’ you are mentioning here and on Zappateers, where you elaborate on the intro for Hot Head is the effect of a snare drum’s carpet animated by guitar amps. It’s audible on the 1986 CD and it’s more prominent on the 2015 SACD which simply has a crisper EQing, IMO much to the benefit of the whole Magic Band plus the Captain. You may prefer the sound of the US CD but this doesn’t mean the Japanese SACD is garbage. The 2015 master comes close to my 1980 US vinyl copy, minus the surface noise this one has acquired in the meantime, the LP has always sounded 100% stunning. Both, the Caroline Blue CD and the recent SACD have beautiful dynamics and even pretty much the same volume. While A/B omparing both versions the CD sounds a bit more muffled while the SACD sounds more snappy and transparent. That’s what I hear, and both are a feast to play really loud. Sorry, I’m referring to the 1992 CD on Caroline Blue, not any of the 1986 editions! Many thanks Philip for the mail order site, just ordered mine. Can’t pass that up. STEVE: To answer your question to JWB re: best CD versions of Doc & Crow, the answer is: the USA Caroline Records/Blue Plate editions. These are the only ones sourced from the real master tapes. How do I know, JWB said so! As soon as I read that I ran straight to my collection to check what I had. Fortunately for me I am a Yank and those were the first to be issued here, the ones I bought upon release 1990 & 1992. I always thought they sounded great. I’m tempted to get back up copies! hmmm, seems there was an earlier CD for at least DOC, Virgin USA. Guess I wasn’t yet buying cd’s then. CDbanq seem to be out of stock of the Decals remaster. I had a look at CDJapan but also no luck. Does anyone have any other sites they can recommend? Thanks in advance. It could be worth checking again in a couple of days. Just before I ordered mine they were out of stock, then in again. And out after I ordered. Perhaps they only top up their stock one or two at a time. Worth a try. Thanks, Ian. I’ll go and have a look now and keep an eye on the page. Also there’s a ‘Put me on the Waiting List’ button – click on the title (2014 version), and go to the album’s page. It’s just underneath the availability notice. And a ‘Contact Us’ button, top and bottom of page. Let us know what happens. Good luck!